I am one of those people that hardly drinks water and I really struggle to drink as much as I should everyday, especially when I'm not at home which can lead to awful headaches. 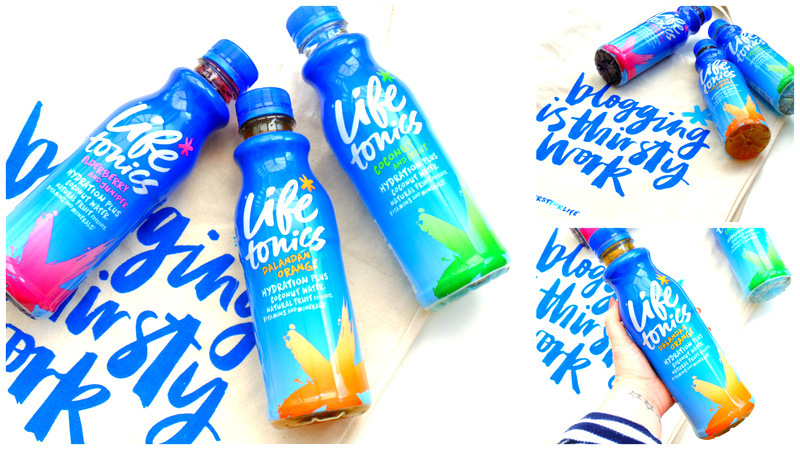 I usually drink cordial which isn't the healthiest option but recently I was very kindly sent a set of three *Life Tonics Drinks (£1.49 each) to test out and they also came with the best bag ever - I love it! The Life Tonics drinks contain coconut water which is high in electrolyte minerals such as potassium, sodium and calcium so it is great for hydration and to replace minerals lost throughout the day through sweating and exercising, for example. The drinks also contain natural fruit extracts, stevia (a natural sweetener) and numerous vitamins. One 500ml bottle contains 40% of your daily required intake of vitamin c, vitamin b12, niacin, vitamin b6 and vitamin b1/thiamin. The drinks are suitable for vegetarians and are suitable for a low GI diet. There are three flavours available: Coconut & Mint, Dalandan Orange and Elderberry & Juniper. I tried the Dalandan Orange flavour first and it tastes amazing! To me it tastes like a less sugary version of Sunny D if anyone remembers that from the 90's. The orange favour is personally my favourite and I would definitely purchase this flavour. Next up I tried the Elderberry & Juniper flavour which is the one I thought I would like the most; it tastes like a berry cordial but because of the coconut water in all of them it makes them taste slightly tropical, in my opinion. Lastly the Coconut & Mint flavour which is my least favourite, I am a fan of coconut but I personally don't like the combination of coconut and mint. Overall, I love the packaging and the benefits of the coconut water in all of the drinks; because of the coconut water each 500ml drink contains 2g of fat although it will be healthy fats which are essential for building cell membranes *A level biology coming in useful here*. I personally love the Dalandan Orange and Elderberry & Juniper flavours, I would buy both but I am not a fan of the Coconut & Mint flavour. The drinks will be hitting the shelves this month in WH Smiths and Waitrose stores this summer! Will you be looking out for these drinks? What do you think of the flavour combinations?